Firstly, Ghany said, it is clear that the meeting at Gordon’s home was not a social one, but rather an official one, a distinction which has implications. “The meeting became a business meeting the moment that Dr Rowley declined the offer of a drink from Mr Gordon as the facility of masking the meeting as a social encounter over drinks was eliminated by Dr Rowley’s action of declining the civil gesture of his host,” he said. “At that point, Mr Gordon became trapped in a business meeting which he allowed to continue having already taken the risk of having Dr Rowley come to his home. He should have ended the encounter at the moment that the social side was eliminated as his judgmental risk had now been converted into a confirmed judgmental error.” He said Gordon’s mistake was compounded by his decision to continue the meeting and then worsened when the chairman appeared to divulge information about matters that related to the Commission. Further, Ghany said, the lapse of judgment on the part of Gordon now jeopardises the appointment process which is ongoing involving Carmona, who has stated he has interviewed at least 40 persons. Ghany, who is also coordinator of Constitutional Affairs and the Parliamentary Studies Unit, UWI, said Gordon ought to have known that such a meeting could bring the Commission, once more, into disrepute. Carmona last week Sunday said appointments to the Commission were expected within two weeks. Ghany also stated that the Office of the President may have also been undermined in another way by Rowley’s election to seek information from the Integrity Commission chairman behind the back of the former President, George Maxwell Richards, to whom Rowley had referred purported emails naming high Government officials. The disclosure of the meeting came last Thursday after it was raised in Parliament by Government Chief Whip Dr Roodal Moonilal. 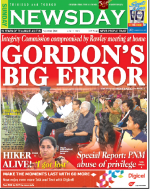 Hours after Moonilal raised the issue, the Commission Registrar, in response to queries from Newsday, released a copy of an aide memoire which gave Gordon’s account of the meeting. The aide memoir, dated May 15, gives Gordon’s account of what happened after Rowley attempted to arrange an “urgent meeting” with Gordon on May 15. The chairman of the Integrity Commission then took steps to try to contact Rowley, the Diego Martin West MP, Opposition Leader and former PNM minister. “I attempted to reach him without success and left a message on his answering machine,” Gordon says. He made a second attempt, which was successful. “Not having heard from him (by 6 pm) and mindful of the urgency expressed earlier I tried again to reach him and this time did so,” Gordon states. Rowley told Gordon he was on his way home, prompting Gordon to make a suggestion. Gordon says Rowley informed Gordon that he had “reason to believe” that Richards had referred a matter to the Commission and Rowley wanted to embark on a “certain course of action” since two months had elapsed. In response, according to the account of the chairman, Gordon informed Rowley that the matter could not possibly be before the Commission since the Commission did not have a fully- appointed board. Rowley, who declined to respond to queries on Thursday, confirmed and corroborated Gordon’s account on Friday. He defended the meeting, saying it was nothing sinister. He said he met with Gordon to seek information on the purported email materials he had sent to Richards. To lead out in Integrity you got to have Integrity… If everyone in the Commission had a bit of Integrity it would have never come to this, Now who would Screen the Integrity itself?? Would we be hearing about another Body coming into existence to Screen the Integrity Commission?? Now if What I hearing about this Hoax E-mail thing that the experts are saying, What would be happening now? Mark my words. The alleged Section 34 email document could be the end of Opposition Leader Dr Keith Rowley and not of the Government as he intended. Too many things do not add up; too many contradictions. The first question is why Dr Keith Rowley took the unauthenticated document to the former President George Maxwell Richards and why he did not submit the document to the Integrity Commission himself. Rowley desperately wants to become the PM of T&T. His actions are those of a desperate man hungry for power.The PNM and its supporters have made no statements or given no press conferences on this matter. Where is Fixin T&T, T&T Transparency,and the NGO’s on this corrupt and outrageous action of the Leader of the Opposition in collusion with the head of the Integrity Commission? No protest marches in POS? Integrity Commission chairman Ken Gordon’s statement yesterday issued the following statement on his private meeting at his Glencoe home with Opposition Leader Dr Keith Rowley. (a) shall not be subject to the direction or control of any other person or authority. (c) the Commission shall have the power to do all such things as it considers necessary or expedient for the purpose of carrying out its functions. When Dr Keith Rowley, Leader of the Opposition, called my office at approximately 2.23 pm on Wednesday May 15th, 2013, I was not available. He left a message with his cell number requesting an URGENT meeting. We later attempted to return his call and in turn left a message on his machine. At around 6.00 pm it occurred to me that he may not have received the return call message. I was by that time at home and called him myself. He advised that he was on his way home. In response to my question, he confirmed that the “URGENCY” continued to exist. I have known Dr Rowley professionally for some time but until that afternoon he had never visited my home. My understanding was that he wished to communicate with me on an URGENT matter. Such a matter could have been about anything, given the extreme times in which we live. I could have said no, not today, see me at the office tomorrow. But then I could have been faulted for not making the time to even listen to what the Leader of the Opposition considered URGENT. Also mindful of the remit quoted above from the IPLA Section 5(2)(a) and (c) which clearly provides the authority to proceed in accordance with what was considered necessary I concluded that in all the circumstances I would see Dr Rowley briefly and right away: a decision I would have taken in similar circumstances had it been the Prime Minister, the Attorney General or any other public official… and I add they would most certainly have expected me to do so. I suggested to Dr Rowley who does not live far from my house in Glencoe that he meet me at my home. He arrived a few minutes later. The contents of the conversation which we had are set out in the Aide Memoire which has been previously circulated. The brief meeting ended and he departed. I immediately wrote by hand the Aide Memoire which was typed the following day. I personally handed the document to the Registrar later that day to await the appointment of the new Commissioners and the Commission’s first meeting. It is with regret that I now turn to some unfortunate statements and distortions of fact which have been reported in the media. In the first instance when I confirmed the meeting had taken place and the Aide Memoire was made available to the public, the absurd charge was made that the meeting was part of a political conspiracy which, if only for the record, I categorically deny. It has also been suggested that the same lawyer used by Dr Rowley at the Privileges Committee may have been retained by the Commission to render an Opinion on jurisdiction in the e-mail matter. It was reported and I quote “when you connect the dots it reveals a frightening picture of an attempt by high office holders to topple the Government.” This amounts to an accusation of treason, one of the most serious crimes on the books. Like so many of the other accusations, there is not an iota of truth in that reckless charge. In fact the Opinion on jurisdiction in the E-mail matter which has been the subject of the most incredible speculation was provided by Mrs Deborah Peake, Senior Counsel who is not Dr Rowley’s representative at the Privileges Committee. Let me make it clear that I accept that in a perfect world the meeting with Dr Rowley ought to have taken place at the Office of the Integrity Commission with an officer present. But that world seldom exists. In the circumstances which existed on Wednesday May 15th, meeting briefly with the Leader of the Opposition and recording what had transpired for the Commission’s attention was the rational thing to do. If a Commissioner can be entrusted to honour the Oath of Secrecy he can be entrusted to faithfully report on what transpired at a brief meeting with a public official. The question really is integrity, and if he or she does not have it he or she should not be a Commissioner in the first place. The simple fact is that try as we might, we cannot legislate for integrity. • That the decision to meet with Dr Rowley was taken without regard to any form of partisan consideration. It was the fair and rational thing to do and it was not secret. • The meeting was held in full accordance with the Integrity in Public Life Act, one of the Laws of Trinidad and Tobago. • A report on what took place at the meeting was made and preserved for the New Commission when appointed, to ensure full transparency. • The inflammatory and highly irresponsible statements which have been made coupled with the distortions of fact are to be deeply regretted. When an 83 year old man cannot see what he has done is blatantly wrong and has the gall to state that he has the power, this really becomes a comedy encapsulated in tragedy for our twin island republic. The position (Chairman) is a responsible one that needs a responsible person to deliver the entrusted duties. I am sorry, it is not a decision for him to recuse himself from the upcoming hearing but he needs to remove himself from that position through resignation because the scales in his eyes are obscuring his rationalization and justification of holding on to that position. The most pertinent observation arising from the meeting, and the reactions to it, between Opposition Leader Keith Rowley and Integrity Commission chairman Ken Gordon, at the latter’s home, is that this is not a perfect world. That this observation came from Mr Gordon is only to be expected from one with maybe half a century’s experience at highest levels in the public and private sectors, including as a cabinet minister. Mr Gordon’s career includes lengthy tenure as chief executive at Trinidad Express and at Caribbean Communications Network. But it is from a more diverse background that he offered the insight, in Friday’s public statement, that circumstances making for a perfect world seldom exist. The statement sought to clarify how the meeting came about, to respond to the extreme characterisations of it by highest Government officials, and implicitly to reject demands for his resignation. Conceding that the meeting should ideally have taken place at the commission’s office, in the presence of an officer, Mr Gordon argued that he had made the best of the given situation, and had done the “rational” thing. That is, he had facilitated Dr Rowley’s urgent request by meeting at his home, and had immediately composed and filed a report of the event. This predisposition has frequently targeted Government leaders, such as Prime Minister Kamla Persad-Bissessar, Attorney General Anand Ramlogan and Housing Minister Roodal Moonilal. They took the opportunity of the Rowley-Gordon meeting, however, to exploit prevailing negative attitudes. Mr Ramlogan spun such lurid interpretations of the meeting as to provoke from Mr Gordon the response that the Attorney General had accused him of “treason”! Precedent exists for the President to exercise a prerogative to remove an Integrity Commission chairman for conduct deemed unbecoming of the office. In her meeting with President Carmona last week, the Prime Minister may even have urged him to visit that sanction upon Mr Gordon. This remains the President’s call. But Mr Gordon, who has declined to admit to any clear-cut legal or ethical wrong, is hanging tough, and justifiably so. Far more unsatisfactory than that meeting at his home is the stimulation of animus against the Integrity Commission chairman and the howling demands for his head, politically inspired or motivated by vindictiveness. Quitting in such circumstances would do more to hurt than to help encourage independence of spirit among future Integrity Commissioners. May taking a fearless stand for such independence become known as the Ken Gordon Precedent. IN a perfect world, there would be no crime, no poverty, no corruption. Forgive us for believing that the Integrity Commission exists to do its best to ensure that even if we never achieve perfect world status, we do everything to get as near to that perfect world as possible. We dismiss out of hand the explanation by Mr Ken Gordon, Chairman of the IC that in a perfect world he would probably not have invited the Leader of the Opposition to a private meeting at his home. What he fails to realise is that the role of the IC is to raise the level of conduct of persons in public life, and by extension, standards in the country. Such effort starts with the IC itself. To create the perfect world Mr Gordon’s first step would be to do the right thing and to be seen to do the right thing. Was it proper without a Commission in place to act solely in his own deliberation and invite Dr Keith Rowley to his home? By his own admission the meeting was wrong and if the IC chairman does something wrong the only thing he can do in order to achieve this perfect world of which he speaks is to offer his resignation, sending a message that the IC is a body of integrity. He cannot claim that the mere swearing of an oath makes you a person of integrity. Actions speak louder than words. Mr Gordon has cited the law to justify his actions, but there has never been any question over the legality of what he did. Instead, the issue is one that comes down to the question of appearances and the moral implications therein for the damage which a secret meeting with the PNM political leader at his home does to the Commission. In fact, the last thing Mr Gordon should do at this stage is cite the law, when the law on apparent bias – so famously applied in the Basdeo Panday case – makes it clear that what we have here could well be grounds to invalidate future decisions of the Commission. We have also noted the argument advanced by some who are of the view that Mr Gordon’s “error” can be corrected by a simple recusal from the email matter. But this is clearly not so. Dr Rowley is not just Opposition Leader; he is the PNM political leader. Mr Gordon will have to recuse himself from all matters involving the PNM. This means both complaints brought by the PNM against the current Government as well as complaints brought by the current Government against the PNM can now be challenged. Where does that leave Mr Gordon? Surely those complaints will be the bulk, if not the entirety, of matters before the Commission. A simple recusal cannot cure a situation where the Commission has been tainted. Mr Gordon is not only wrong to quote the law in his defence, but he is also arguably wrong on the law. The chairman cited Section 5 (2) (a) and (c) of the Integrity in Public Life Act to justify his meeting. But that section relates to the Commission as a whole, not to individual members. Further, Mr Gordon did not quote the full section 5 (2) (c) in his statement. The section states the Commission shall have, “the power to authorise investigations, summon witnesses, require the production of any reports, documents, other relevant information, and to do all such things as it considers necessary or expedient for the purpose of carrying out its functions.” This implies that the context of this power relates to specific probes and there was no probe because there has been no Commission since March. How does telling the Opposition Leader that a matter is before the Commission and that it is not being investigated because the Commission is not quorate fulfill the functions of the Integrity in Public Life Act, “the functions” to which Section 5 (2) ( c) apply? Further, how can Gordon in one breath tell Dr Rowley that the Commission was not properly constituted and then go on to rely on a power which is bestowed to the Commission as a whole to justify his unilateral actions in inviting the Opposition Leader to his house? This is pure and simple nonsense. Former chairmen of the Commission have had to leave because of errors of judgment. What’s the difference in this case? Perhaps we are further away from a perfect world than we fool ourselves into believing. As the Integrity Commission continues its inexorable spiral into another controversy, the attendant self-righteousness of the chairman, Ken Gordon, now leaves us with yet another wound on this badly wounded and limping organisation. His open declaration that he did nothing wrong by entertaining the Leader of the Opposition, Dr Keith Rowley, at his home for a private meeting to discuss a matter that Dr Rowley had sent to the President is enough to make one laugh, otherwise you might cry. The Law Association on Monday issues a statement regarding the meeting between Opposition Leader Dr Keith Rowley and Integrity Commission chairman Ken Gordon, days before Rowley came to Parliament with copies of alleged emails that implicated Government ministers and others in wrong going. The Law Association’s position is that the meeting between Rowley and Gordon was wrong and highly improper. “Rowley, who declined to respond to queries on Thursday, confirmed and corroborated Gordon’s account on Friday. He defended the meeting, saying it was nothing sinister. He said he met with Gordon to seek information on the purported email materials he had sent to Richards.” The idea of a man admitting to a statement he made and confirming an event is, in itself an act of maturity. Every week there is an event, mis-step or some kind of scandal emanating from the PP and there never has been anyone to say or confirm an act in the affirmative. Denial most likely but confirmation almost never! People like Hamid Ghany are very selective in the topics they chose to address and when they do, it is almost always to the detriment of whom they dont like and in the interest of those they support. I am yet to read anything objective in these blogs that make sense without attributing guilt or innocence to a given political entity. As a country, we have a right as citizens to agree on some basic human principles that we can describe as good or bad. Such examples are decency, family, religion, community, support for national defense, support for education (regardless of color, creed or race), love of country, love of our national sports team, agreement with the laws emanating from the parliamentary system of justice. Of course we should be free to support what ever political party or entity we choose to. We should be able to enjoy all of the democratic principles that are described in the constitution. And yes, we should be able to argue, discuss or proselytize without necessarily casting aspersions on others. We write on this blog as though we do not share common geography, language, space, roadways, groceries, shops or laws. We speak as though the laws passed in parliament are for some and not others. We can find a million things with what is wrong with us but if we can somehow manage to share some respect we will be well on our way. Too much emphasis is placed on ownership of holding a piece of paper that ascribe degreed confirmations on an individual without allowing that individual to demonstrate his or her worthiness to hold it. We should hold true of ourselves a nation of individuals who subscribe to having common sense as our first instinct. I refuse to give credence to those who ignore the venalities of Panday, of Sharma, of Kamla, of the PP etc, and only become indignant when the finger can be pointed at someone black, or a political entity they associate with black. I am no longer overly concerned with uniting with others, because we have been leading the unity battle for centuries, only to be treated like unwelcomed suitors. It is time we begin doing what every other group has been doing. Whether it is T&T, Guyana or any other nation with similar demographics, the problem remains the same. People who are religiously and socially doctrined into believing that they are superior, and allow that to determine their views, their reactions, their every will. By skillful and at times deception they are attempting to alter racism from what they have been practicing for centuries, to the modern day reactions and activism against it. It would be great if the nations mentioned could come together and live as nationals. However, the cost of that, as we can clearly discern form the actions of the regimes in Power in T&T and Guyana, is the acceptance of a society based all people being equal but some people being more equal than others. And entering into such arrangements with the Orwellian Porcine Characters who are sponsoring this arrangements amounts to a fate worse than death.